GREAT VALUE AND QUALITY = Talar Medical Wound Healing Kit The Talar Medical Kit was developed with top-quality products that can be used for nail surgery, skin biopsy, wart removal, wound care, post laser surgery, minor surgical procedures and abrasions. The pre-packaged kit contains a 30-day supply of everything necessary to meet the needs of your patient’s post-op care. Each kit (#DYKM1528) contains: 1 – 1 oz. MEDLINE SKINTEGRITYY Hydrogel (with a needle nose tip that fits perfectly along the nail groves) 1 – 7.1 oz. 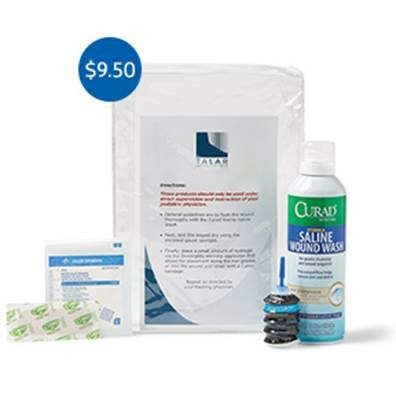 CURAD Sterile Saline Solution 30 – 2” x 2” MEDLINE 8-ply Woven Gauze Sponges 30 – 1” x 3” CURAD Fabric Latex-Free Bandages The Kits are also customizable to your specifications! Make it a 45-day supply by customizing your kits to include two applicators of hydrogel and 30 gauze sponges and bandages or 50 or whatever you desire. By dispensing these Kits right from your office, you not only increase patient compliance and outcomes, but your revenue as well! The Talar Medical member price is $9.50 each and each Kit can retail for $35 to $40 (that’s a profit between 255% or 305%!!!) NOW THAT’S A WIN WIN!!! To order a supply of Talar Medical Wound Care Kits, simply contact your local Medline representative or contact the Talar Medical Member Services Team at 401-424-1827.